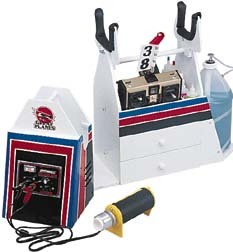 The RC Field Box for use with RC Glow Plug Engines. 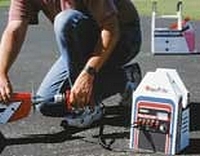 The ideal RC Field Box is one that carries your model airplane fuel, starter, battery and RC tools and is not too heavy! It is all too easy to put everything you think you will need, into your field box, and then find it is far too heavy to lug from the car to the flight line! The first principal to apply is to keep things simple. A full jug of model airplane fuel and a 12V RC battery are heavy enough, on there own, so keep the compliment of hobby tools to a minimum and leave the heavy duty tools in the workshop! 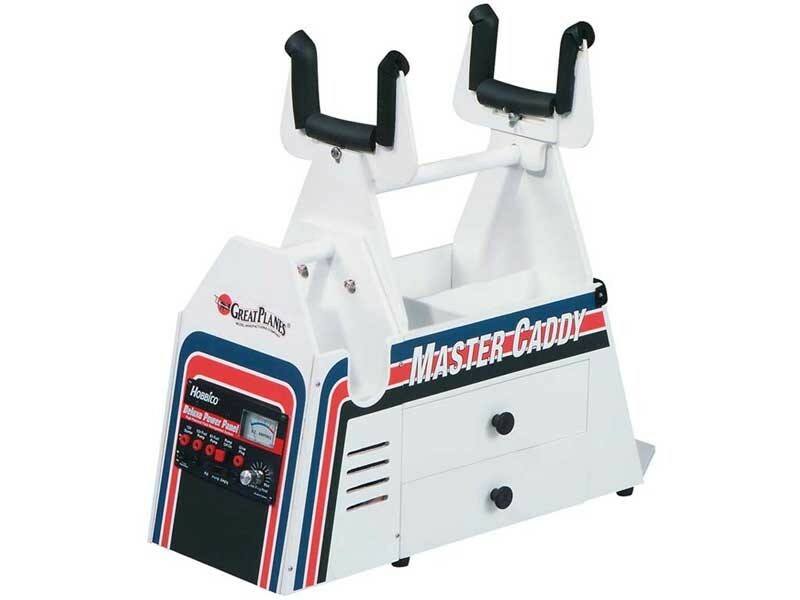 The box we are looking at today, is the Great Planes Master Caddy. It comes pre-built and finished and all that needs to be done is the basic assembly. A unique feature of this box is the removable Auxiliary Power Station (APS), This unit can be seen at the far left of the RC field box. It contains the 12V battery, the starter and the power panel. The advantage of this design, is that the model can be assembled and fuelled, in the pits or at the car and then the APS can be removed from the field box and the engine started at the flight line. I have found this arrangement, very useful at one club that I fly and a real plus at some fly-ins I have attended. The two drawers can hold a lot of stuff, but remember what I said about weight! A layer of rubber or thin foam drawer liner can keep things from rattling around too much. Regarding which tools and things you need to carry, Screwdrivers, both blade an Philips heads and a pair of pin-nose pliers along with a good set of tweezers, is a must. I find that a particular model needs hardware peculiar to it, so I usually have a small pill bottle, with all the nuts and bolts required, along with a few spares, clearly marked and stored in one of the drawers. A fresh bottle of CA (small) is always useful along with a roll of electrical tape and a spare RC glow plug. 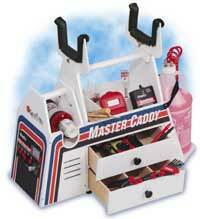 The Great Planes Master Caddy Field Box is in stock. Here is a perfect 12V battery for your RC field box. 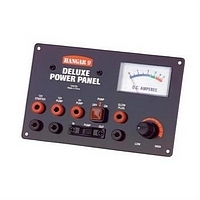 Supplied by Hangar 9 it provides a full 7amps of power and comes complete with a 120V charger. 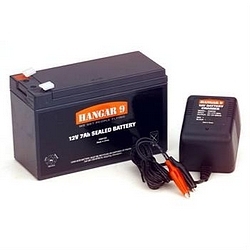 This heavy duty starter, by Hangar 9, will start up to1.8 cu.in. capacity RC engines. This unit has a 2 year warranty and produces up to 248oz/ins of torque. The Hangar 9 Mosfet power panel supplies power to fuel pumps, starters and RC glow plugs and will fit well in any RC field box. There is no current drain when not in use and comes with a 2-year warranty. 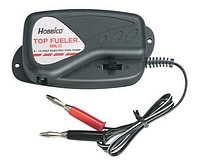 The Hobbico Top Fueler is a 12V DC fuel pump, for glow model airplane fuel only. It can also operate on 6V and notice the 3-position switch. Notice also that the power panel above also has a 3-position switch. To avoid confusion, decide which switch you will use and always use it! Notice that it comes complete with banana plugs to plug right in to the power panel. 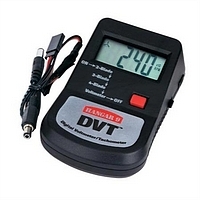 The Hangar 9 DVT Digital Voltmeter Tachometer is, as it 's name suggests a combination digital volt meter and tachometer. As a tachometer it will read speeds up to 23900 RPM, in 10 RPM increments and can be switched to sense 2,3or 4 blade props. When used in the Voltmeter mode, it can be used with both JR and Futaba polarity RC transmitters. When testing receiver packs, it applies a load of 240mA for 4-cell packs and 300mA for 5-cell batteries. For 9.6V transmitter batteries, a load of 400mA is applied. A 9V dry cell battery powers the unit and it is monitored and condition displayed. 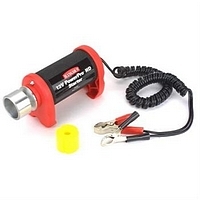 Du-Bro 666 Kwik Start Glo Plug Igniter comes with a mounting clip and a 120v charger.